The first major sanctioned MMA event in the state of Massachusetts could feature a rematch between two of the top female fighters in the sport. Former champions Tara LaRosa and Roxanne Modafferi may square off for a second time at the upcoming Moosin: “God of Martial Arts” card on May 21st. Modafferi and LaRosa are tentatively set to do battle at a catchweight of 130 pounds. 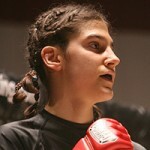 The fight has received official approval from Strikeforce, to which Modafferi is currently under contract. LaRosa won the pair’s first meeting at 135 pounds in March 2006 via three-round decision. Modafferi (14-5-0) had held titles in multiple promotions and holds big victories over Jennifer Howe (twice), Marloes Coenen and Vanessa Porto. She made her Strikeforce debut last November in a rematch with Coenen, but succumbed to a first-round armbar. Since that time, Modafferi has rebounded with an impressive decision victory over tough veteran Molly “The Maulinator” Helsel. A win over LaRosa, widely regarded as one of the two best female fighters in the world, would be tremendous for Modafferi’s career and could sway Strikeforce to award her a title shot against Sarah Kaufman. LaRosa (18-1-0) has not lost in close to seven years. That lone defeat came against Jennifer Howe, whom Modafferi bested on two occasions, but LaRosa has improved in leaps and bounds throughout her career and is thought by some to be the number one pound-for-pound female fighter in the world. Having defeated a who’s who of the 135-pound division, LaRosa dropped down in weight for a trio of 2009 bouts and picked up victories over Alexis Davis, “Slick” Sally Krumdiack and “Vicious” Valerie Coolbaugh. Strikeforce has already expressed interest in signing LaRosa in the future. The Moosin card, set to be the first major MMA event to be sanctioned in Massachusetts, has not yet been officially approved by the state’s athletic commission, but is expected to be given the go-ahead later this week. UFC veterans Travis “Diesel” Wiuff, Travis “The Serial Killer” Lutter and Yves Edwards are all expected to compete on the May 21st card, which will be held at the DCU Center in Worcester, Massachusetts. Former UFC Heavyweight Champion Tim “The Maine-iac” Sylvia and five-time World’s Strongest Man Mariusz “Dominator” Pudzianowski will clash in the main event. Update: Strikeforce has confirmed that they have officially given permission for Modafferi to participate in the event if the bout with LaRosa is put in place.